Design: Curved mouthpiece with upward curve and jointed barrel in center. Entire mouthpiece is tilted forward. A mild bit, the Myler Forward Tilt Ported Barrel mouthpiece works well with intermediate and finished horses. 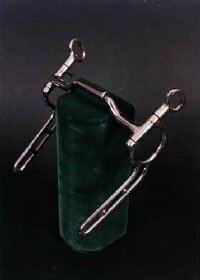 With independent side movement, it is a good bit for bending, or for lifting the horse that gets behind the bridle. Also it is a good bit for stopping and works well for horses that need a lot of tongue relief. Works well in single driving or team driving. Also available without bushing.